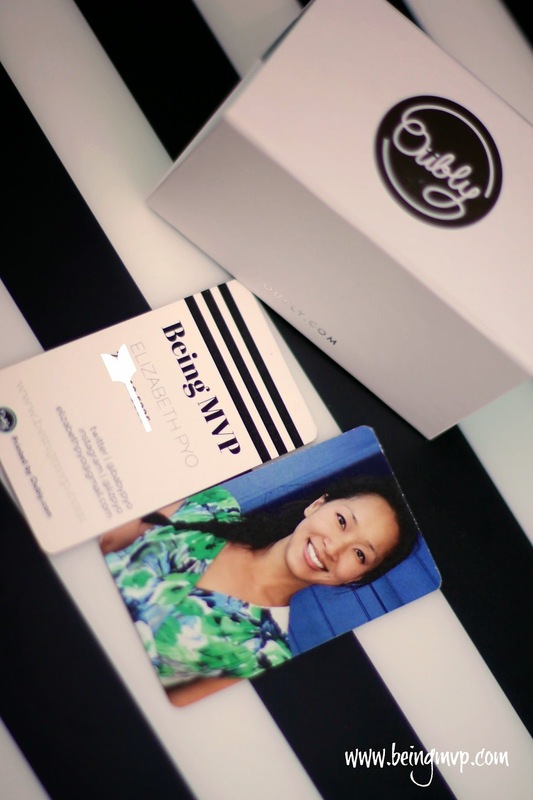 Disclosure: I received business and note cards for review from Oubly. All opinions are my own. I can't believe that in just a month I'll be going to my first BlogHer conference....by myself. I wanted some new business cards to take with me since I have changed my look and address since the last time I ordered some, I was excited to find Oubly.com. They offer beautiful stationary that makes you giddy once in your hands. Although you can upload your own design to truly make a unique business card, I used one of their templates - Hairsalon - because I am currently obsessed with black/white stripes. It is really easy to design online and preview how your card will look. I decided on rounded edges and added a deluxe edge in gold. I have to admit that I didn't know the actual quality or type of paper when placing the order but wow was I surprised when I received these and held them in my hand. Just from a brief view in the beautiful packaging, my husband exclaimed that my business cards were probably super thick. He was right! These feel like mini coasters and they are stunning. Although the design is simple and clean, the pop of color on the edges really makes it unique. I've never seen such a business card and although I used to think my husband's business cards were the coolest, I now think otherwise. I am so going to enjoy passing these out at BlogHer and sharing the Oubly love. I love stationary. As we are engrossed in the technology age, a good old fashioned handwritten note seems to be nostalgic yet much more endearing. 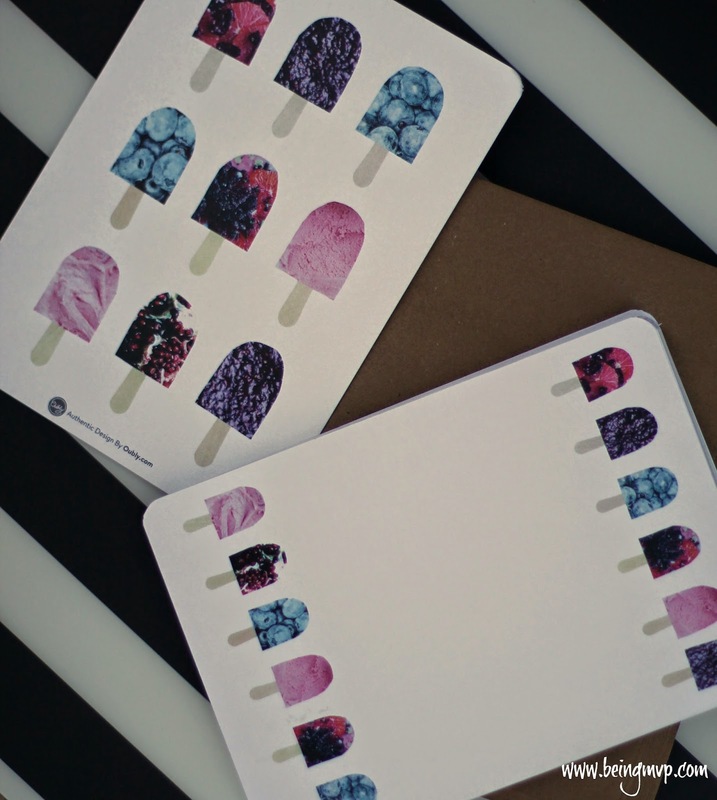 The Fruit Popsicles note cards are whimsical and luxe, especially with the pearl crystal metallic paper. These can be used as personalized stationary with name and/or photo or you can even leave it blank for an all occasion card. I decided to leave it blank as much as I love personalizing everything because I can use them for birthdays, graduation, thank you and more. Time can fly by as you peruse the Oubly.com site. They truly have everything from baby shower invitations, birth announcements, wedding invitations, holiday cards and more. Come on - - how sweet are the personalized birthday invitations designs? 3 Winners will Each Receive a $30 Gift Code to Oubly.com! LOVE the sushi party kids thank you notes! I've always loved different stationary and types of pens, hoping my kids catch the allure as well. I would get some business cards and let my daughter design them with her own art work to advertise her art. 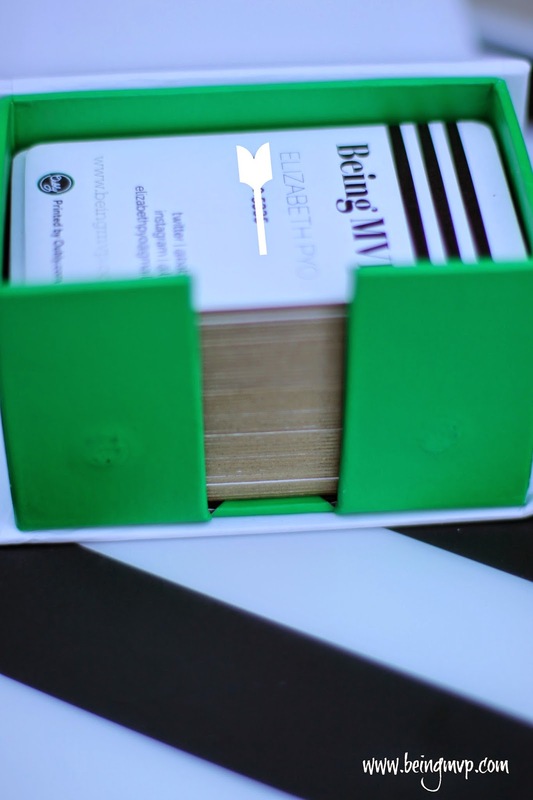 I love stationary items such as business cards since they are helpful when you need a service and I love to send greeting cards. Hi! I have always loved stationery. I'm not sure why. Maybe because it's colorful and has images. I still have stationery in a box from when I was a teenager. lol If I won, I would get the Peaceful Dove Holiday cards to send next Christmas. Thanks for the chance! I love sending cute cards! I would get birthday invites for my little man's 2nd birthday! I would get some I miss you cards to send to my son who lives in Arkansas. I love stationary because I love sending something nice instead of plain paper notes. I would get some kids stationary for my daughter. I believe that letter writing via snail mail is a wonderful way for kids to practice their penmanship. Plus, what kid doesn't like to get mail? I really like the 'Lil Monsters Miss you cards. They are adorable! I love stationary because it helps me connect on a more personal level with my loved ones. I would order birth announcements for my little girl that is due in July! I always hand pick my Thank You cards and I love giving notes on beautiful stationary! I like the Just a Peek note cards. I love stationery because people are always so surprised and happy to receive a hand written note in their mailbox! I'd also get some business cards...they have a lot of nice choices in addition to letting you provide your own graphics. I love the address labels especially Dotlightful. I would love Christmas card because I got to reach out to friends and family. Thanks for sponsoring this giveaway! I ran out of thank-you cards and would love to get some new ones! I would love to get an assortment of thank you cards, it's always good to have some of those on hand. I would get party cards. i don't know what they would be for yet, but I would like to have nice cards for my next event. I would choose the owl gratitude cards. I love sending handwritten thank you cards and am teaching my kids to do the same! I would get the Kokeshi Dolls thank you cards. I like stationery because I love writing letters! I would get the Splish Splash Party invitations for my grandson's pool party in August I love stationary because I like to write notes/thank yous!